This is a middle grade novel written in verse that takes after the Japanese Tanka form. 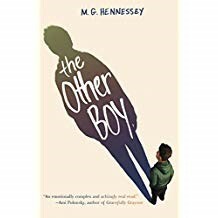 Garvey is a boy who is teased at school for being overweight and is constantly pressured by his father to be more athletic like his older sister, Angie. He has a best friend, Joe, a new friend, Manny, and a talent for singing that lands him a solo in the school’s chorus concert. Through Garvey’s singing talent, he finds a way to connect with his father and combat the bullies’ rude remarks with a newfound strength and purpose. During World War II, Annabelle lives on a farm in a rural area of Pennsylvania. Her quiet life changes when a new girl, Betty, moves nearby to live with her grandparents. Betty proves herself to not only be a bully to Annabelle, but to Toby who is a World War I veteran who lives in a smokehouse near Annabelle's farm. Betty lies and blames Toby for bad things that she did. Soon Annabelle has to be brave to stand up to what Betty does. Castle "Ghost" Cranshaw found out he could run the night that his father chased him with a gun. Since then, he has been causing problems - until he ventures to the track one day and meets Coach, an ex-Olympian who is leading a middle school track team of talented runners, and he finds new purpose in his life. If Ghost can stay out of trouble, he has the potential to be a star on the team, and his chances increase as he learns to trust his teammates and understand that everyone has their own story. Ben, a former child of foster care, is happy to have a home with his mom and the library books that keep him company. 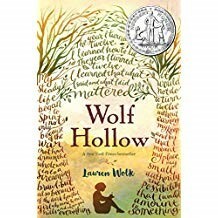 It is outside the library where he rescues a stray dog, who leads him to Halley, a girl who asks for his help in writing her novel while going through chemotherapy treatments. When tragedy strikes in Ben's life, he has to depend on hope and faith to help him realize true friendship and the meaning of home. 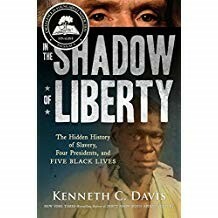 The history of the United States and slavery is told through the lives of five enslaved persons and four presidents who were their owners. Starting with George Washington and the story of two of his enslaved persons and their part in the Revolutionary War, along with Thomas Jefferson, James Madison, and Andrew Jackson, the irony of the Founding Fathers creating the United States on the foundation of "all men are created equal" were slaveholders. Max is excited because her middle school is getting a robot named Fuzzy who will attend their school. She is chosen to teach "him" how to be a middle school student and in the process, starts getting in trouble by the vice principal who is a robot. Max and Fuzzy find out that the vice principal is sabotaging Max's scores so that she'll have to go to a different school and adventure ensues. Hideout has it all with bad guys, police chases (both in cars and boats! ), adventure and nights out in nature. Sam was embarrassed when he and a friend were beaten up in front of the whole school and now he's determined to prove himself brave. 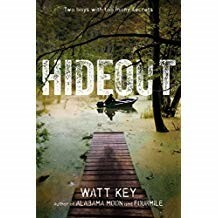 So when Sam meets Davey living alone in the Alabama swamp he decides to help and gets in way over his head. Shane is an ordinary boy who has a deep secret he is keeping from his best friend and everyone else. When a bully finds out Shane's secret and spreads it around the school, Shane's life becomes complicated and starts to spin out of control. He has to use great courage and learn to trust other people in the midst of hate that surrounds him to prove that he is still just a regular boy. Charlie and his family must find a way to survive when all electricity unexpectedly goes off at midnight on New Year's Eve. While the community is at odds with a local group of survivalists, Charlie undertakes a dangerous journey to get medicine for his diabetic mother. Jonathan is the newest boy to arrive at the Slabhenge Reformatory School for Troubled Boys. This type of jail is an ancient, crumbling stone castle located in the middle of the ocean. Jonathan has been court ordered to serve 10 months in the detention center, and he accepts this punishment because he feels guilty and responsible for the crime he was charged. While still in the middle of adjusting to the new situation a freak accident leaves the troubled boys without any adult supervision. A whole island of troubled kids are free to create more trouble. This undeserved freedom brings unexpected danger to all involved. The boys must survive while revealing details about their crimes and the reason they were each sent to the reformatory school.